What are the set up costs for a new car wash business? Home Automatic Car Washes What are the set up costs for a new car wash business? Love the idea of a car wash but have no idea of the set up costs for a new car wash business? To be honest there is certainly no fixed, one-size-fits-all, dollar figure for this type of thing. There are so many variable factors depending on what sort of car wash you want to set up. We will cover some very broad numbers to get your head around the finances. Setting up a brand new car wash business from the ground up is probably more expensive than most people anticipate & it can be a fairly lengthy process. A typical site of one Automatic In Bay Car Wash & 3 Self Serve bays will cost anywhere around the $700,000 mark to build & approximately $350,000-400,000 in equipment costs. The costs above might sound a little confronting to those who have little knowledge of the industry. So where do all these costs come from? Construction costs are your biggest overhead in the set up costs for a new car wash business. It’s just not as simple as hooking up to the water supply & washing cars. Check what’s in your DA & engage a designer who specialises in designing car wash sites, as their knowledge will be invaluable during the process. We recommend Tracey from TMC Design Group. Tracey has been designing car washes since 2004. She has a clear understanding of what makes a successful wash site & how to avoid lengthy delays & building variations. You need to manage your design & construction right from the start. Building costs & council requirements can blow your figures out if you’re not dealing with people with actual industry experience. Car washes require underground pits to deal with the water requirements from local authorities. All of the contaminated run off & sludge has to be collected & disposed off so as not to pollute the stormwater drains. Whatever you do, seek advice from industry professionals. We’re happy to give you some guidance & advice – you can contact us here. We also have some tips below on how to reduce costs when setting up your new car wash business. As a rule this process should take around 12 months IF you have a motivated architect. Your design must have accounted for all council stipulations & your builder needs to be reliable. Over the years we’ve seen set ups completed as quick as 6 months. Others have spanned out to the 2 year mark. If you use someone who is well versed in car wash design the process will be much shorter than going in blind. So is a car wash business profitable? Yes of course (we even own our own car wash sites so we know this for a fact). A well-designed site with high quality equipment, in a good location is, in our opinion, going to be successful. Since Carwash World started in 2005 & we are witnessing steady growth for all of our customers. 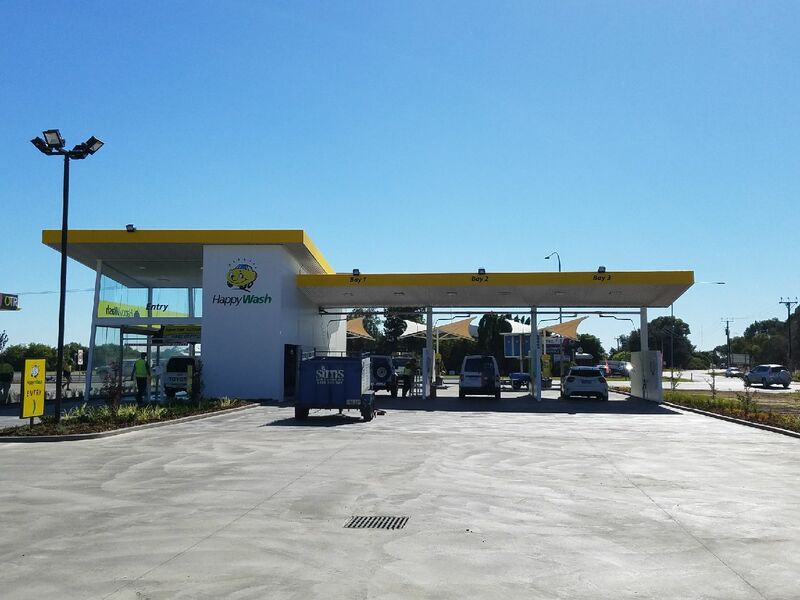 IBISWorld reported that the Australian carwash industry is now forecast to be worth approximately $585 million by 2020. Between 2010-2015 the industry saw 2.5% growth. In the IBISWorld, report, the article stated within the carwash market, automatics account for 46.5 percent, & self serves for 37.6 percent with the remainder hand washing. Environmental concerns & higher density living is making services such as car washing much more popular. Car owners love the convenience of a drive in, drive out option. How can I save money in the set up for a new car wash business? Take over an existing car wash. This is an excellent way to avoid all of the build & set up costs. You’re simply buying the business at market value with an aim to grow it. You can then retrofit with new & updated equipment without the need to spend on construction. Don’t over engineer the build – we see a lot of wasted money spent needlessly on elaborate designs when a simple construction would suffice. Get quotes for a fixed price build. Know your council & DA requirements or have someone on your team that does. We cannot stress enough the importance of an educated team assisting you in this process. A great example is a designer who misses the fact that some councils require doors on automatic car washes – this alone would add between $15,000-30,000 to your budget. Shop around on things like LED lights & alarm systems etc. But BEWARE, cheaper is not always better. As we know when it comes to car washing equipment, opting for the cheapest option can cost you more down the track. We encourage you to speak to other car wash owners about what works for them. Something that is not an immediate saving but certainly a long term one is adding Recycled Water to your car wash site. The initial expense will save you from purchasing 200 litres of fresh water every time a car goes through the automatic. It will also enable you to continue to trade if we encounter water restrictions again. There’s also loads of other cost saving options we know of, like putting your automatic on a frame instead of being load bearing, opting for prefabricated items such as sewer pits & using lucabond panels instead of tiles on self serves bays. For further advice on a car wash business your planning or for more tips on how not to over-capitalise we welcome you to contact us here.